It may be near the end of the month, but it's nowhere near the end of opportunities for finding some good fresh vegetables and fruit. Fall is one of the most splendid seasons for eating in Japan, if you ask me, and I can't help but encourage you to head on out to the markets and see what's on offer. And while the markets are great for learning what's in season and how to cook it, they are also fantastic places to find local craftsmen and women selling their wares! 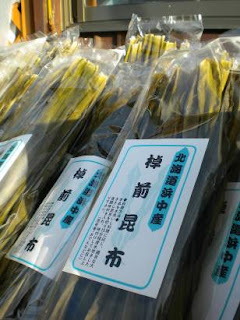 Another photo from our Hokkaido trip, but this time of dried konbu. We met the fisherman or ryoushi who harvested it (and made a mean bowl of ramen to boot!) while camping in Hamanaka. Yummier than it looks!